Karen has an alpaca farm so she is always spinning alpaca fleece. 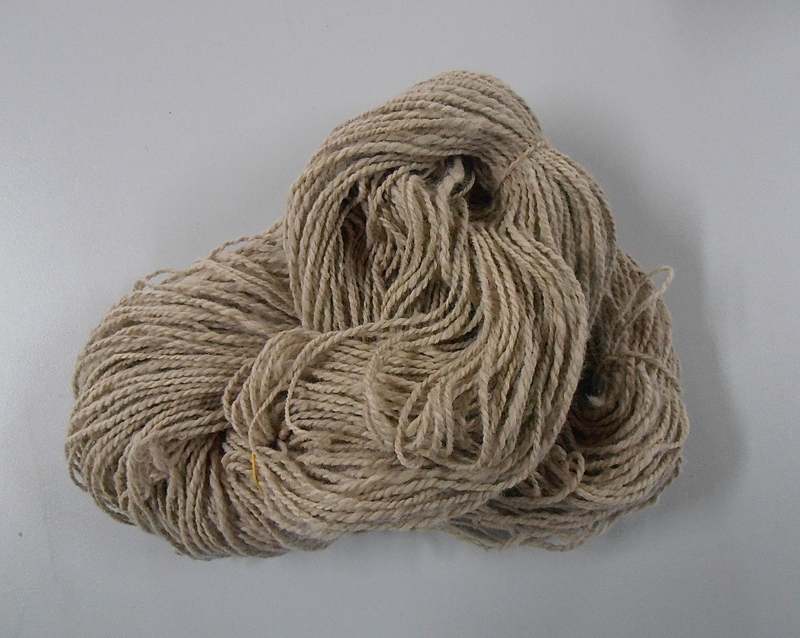 The fleece is always so soft and beautiful and her spinning is always super fine and super neat. This fleece came from an alpaca called Kerrie-Anne and here is Karen winding off the bobbin and below is another skein from the same alpaca. I look forward to seeing what this yarn will become. 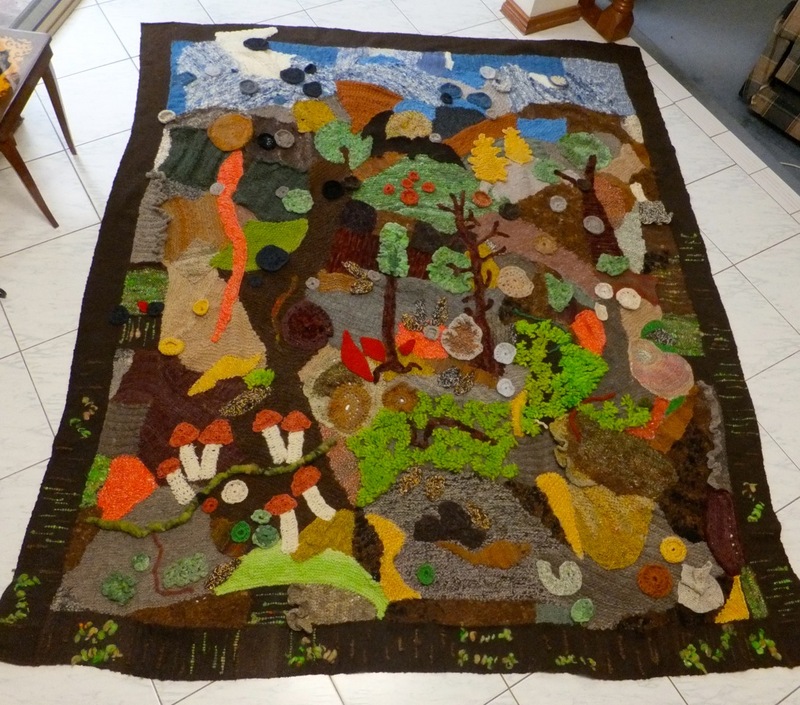 This beautiful rug was designed and created as a collaborative effort by our members using ninety percent handspun, hand dyed wool fleece, alpaca, silks, cotton and camel, and made using a combination of knitting, crochet, weaving, French knitting, weave-it squares, felting and sewing techniques. This was originally designed and the wool all hand spun to create the textures in this stunning piece of art. The weaving was done on a Sampleit loom. The hours of work are too many to be estimated, however it was made with love. 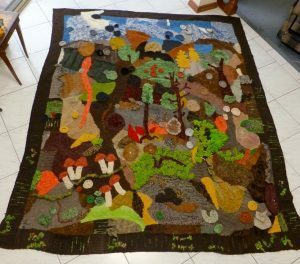 Close your eyes for a moment and imagine walking through the forest on this beautiful unique rug which is 187cm wide and 226cm long. A big thank you to all those who put in so many hours to create this magnificent piece. 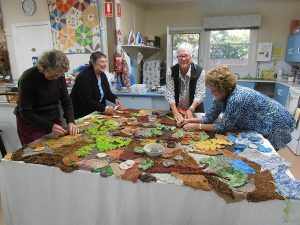 Some of the ladies working on the rug. 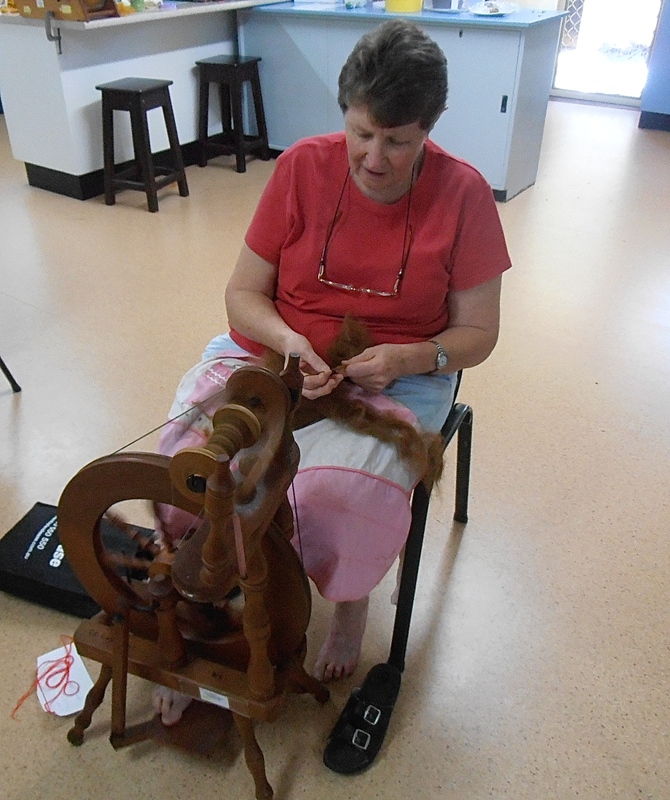 Gay is spinning some lovely brown alpaca. 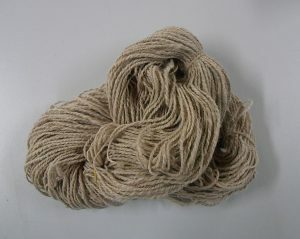 Gay does lots of spinning, weaving and knitting, so I wonder what’s in store for this gorgeous fibre. 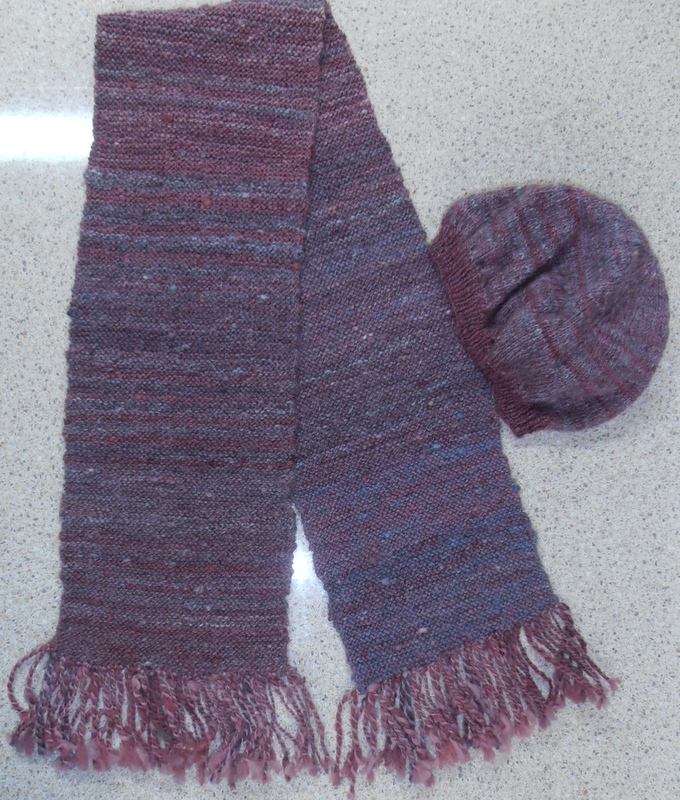 Bev has finally finished the alpaca and wool hat and scarf for her niece’s 60th birthday. The hat was completed at the beginning of April this year as you can see in a previous post, and she started spinning the wool toward the end of last year. You can see her spinning the alpaca here. Bev’s niece received her lovely gift during a visit to Australia in June. So beautiful and very warm. Karen has knitted this beautiful shawl. Karen only started knitting a few months ago and this is exceptional. 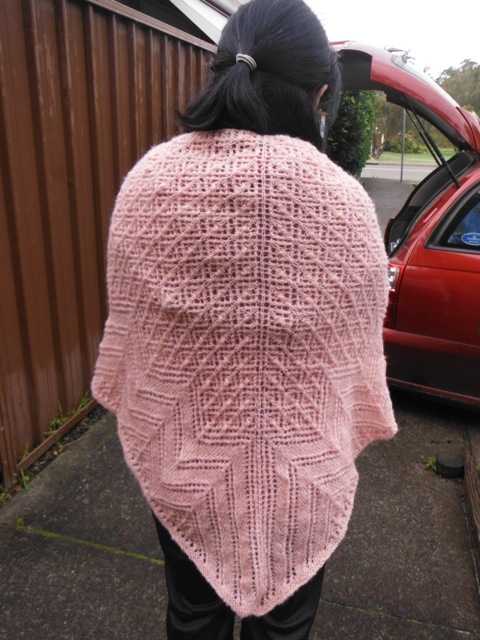 She used a commercial yarn to test this pattern before using her own Alpaca yarn when she spins it. We can’t wait to see that when it is finished. Great work Karen and keep it up. By Lyn A. 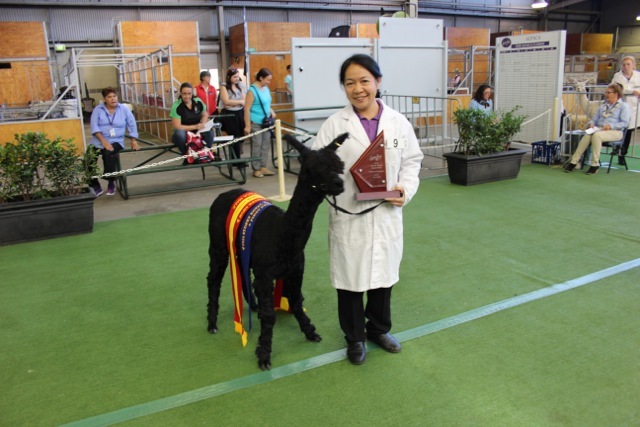 Reserve Champion Jnr. Male Suri. Paraders Senior Champion, Senior Reserve Champion and Intermediate Champion. 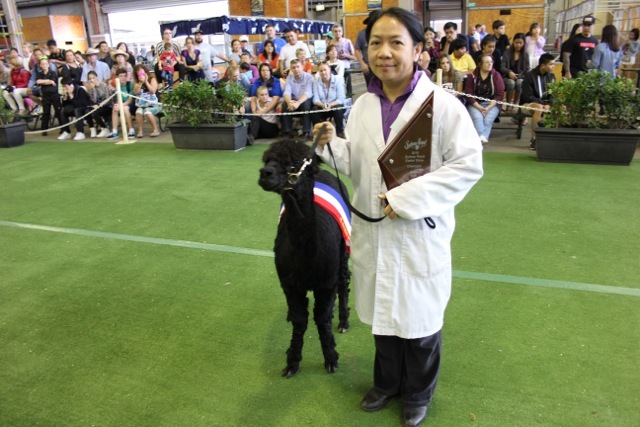 Senior Champion Trainer and Supreme Master Trainer. “Paraders” is made up of Showmanship and Stockmanship. 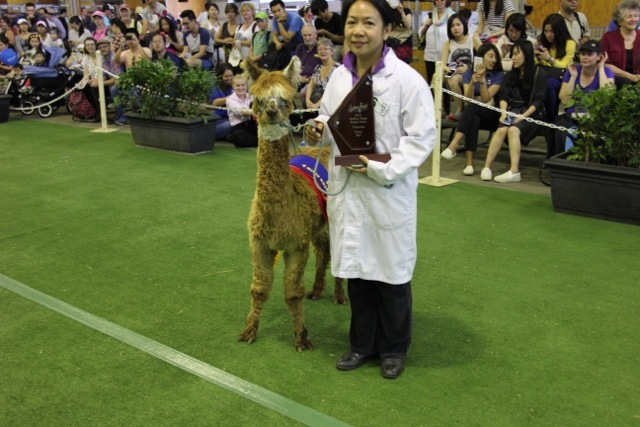 Trainer awards are based on Stockmanship only. 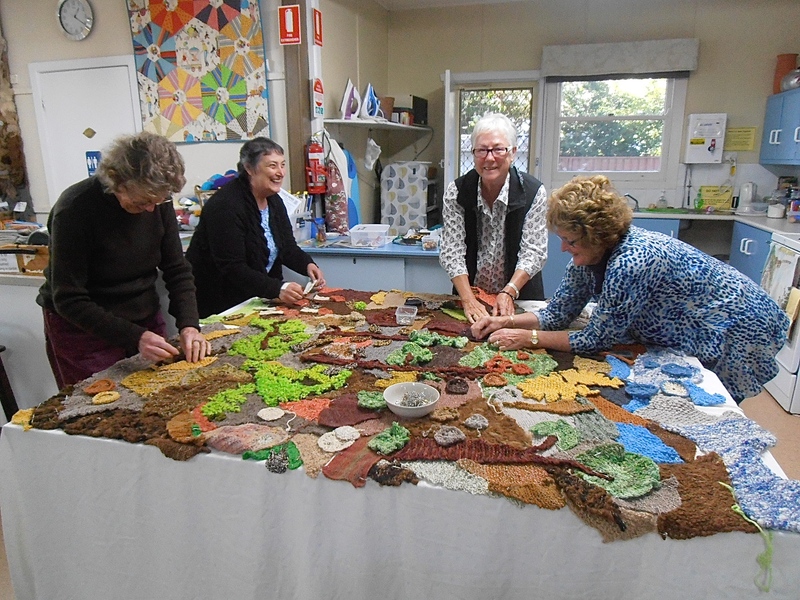 Keep up the great work Karen and the Central Coast Handweavers, Spinners & Textile Arts Guild Inc. wish you all the best in the future. By Lyn A. 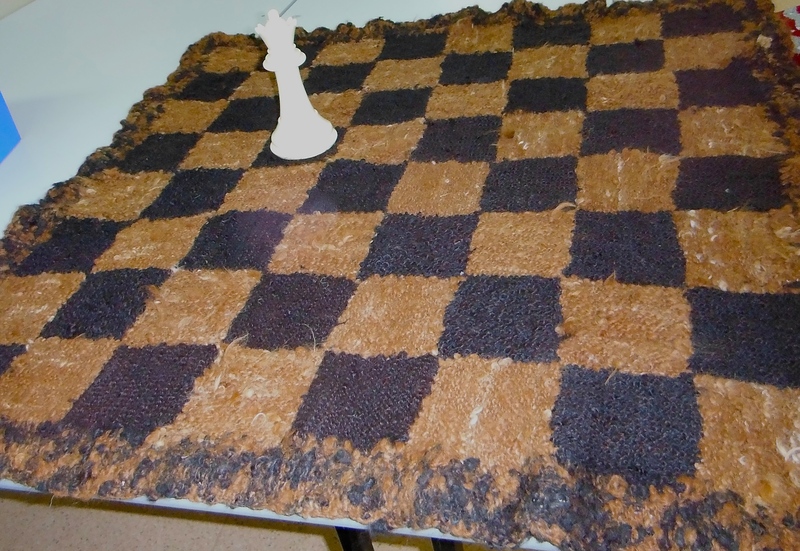 The Chess set rug is now finished with the chess pieces. This rug is knitted with Alpaca and crocheted on the edge. This project was designed by Debbie and it is now ready for the Gathering and Exhibition in 2016. Thank you to everyone who participated in this project. By Lyn A. We have started making prizes for our Gathering in March 2016, and this is just the beginning. These shawls are the first of our collection of prizes for when we host the Gathering in March 2016. These were made of hand dyed and spun wool and alpaca. 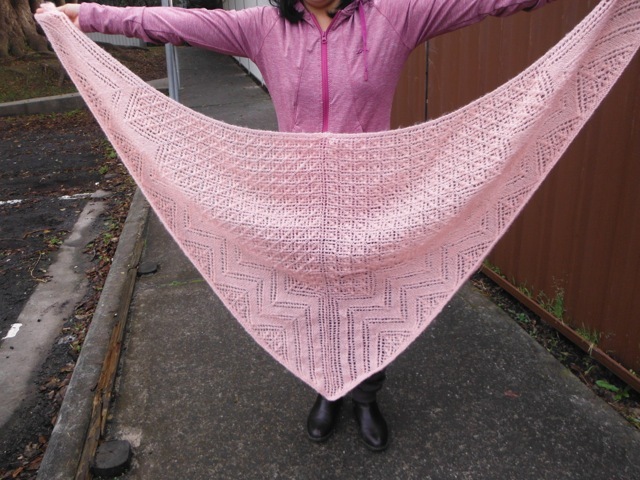 The aqua and white shawl is all crochet, while the coloured is freeform crochet and knitting. Made by Lyn A. This beautiful beret was made by Bev for her niece’s 60th birthday. 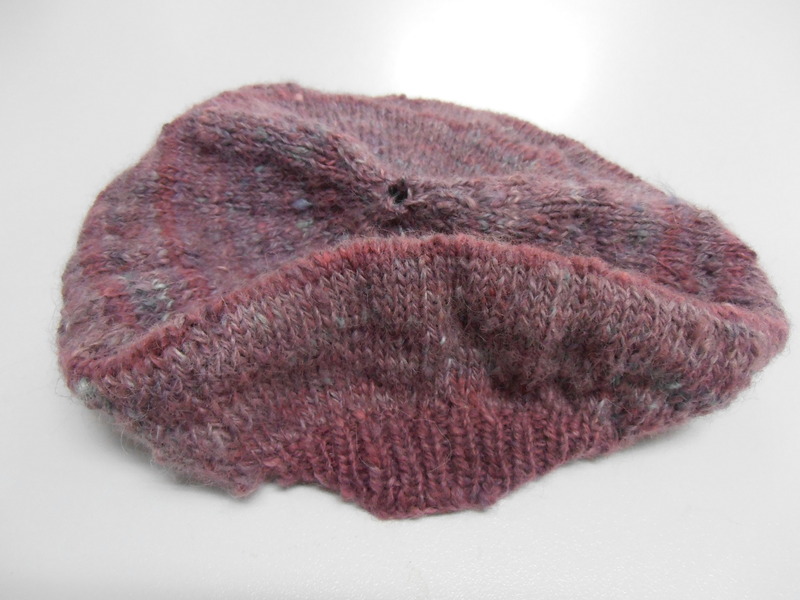 Bev handspun and dyed the wool and alpaca fibre and then knitted it. Her niece lives in a part of America that gets rather cold in winter so she will get plenty of wear out of this lovely beret. These squares are made out of knitted, undyed, handspun alpaca. 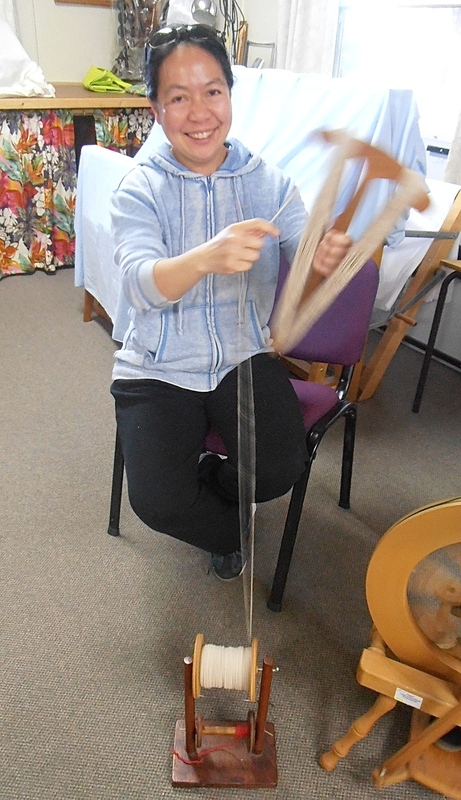 The fibre was all spun by Lyn A. 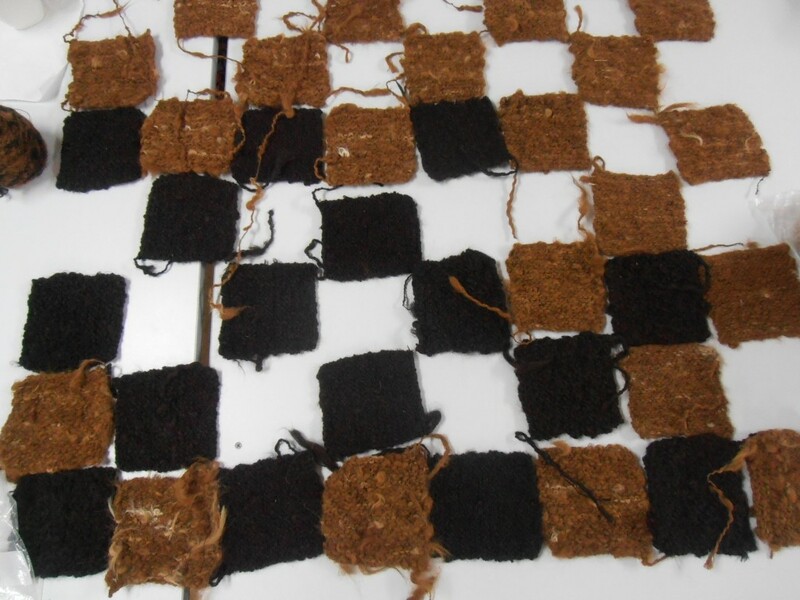 We had originally planned a weaving project, and then Debbie had a fantastic idea which was to make up a chessboard. A bunch of our members took home a ball or few and started knitting the squares. A few more to go and it’s all done. Debbie is sorting out some large chess pieces as each square is eleven by eleven centimetres. Can’t wait to see it finished.